Are you fed up of that latex smell and powdery white finish and ‘used’ cloudy look that many condom brands have? None of these things are an issue when you discover Skins. Once you try them you won’t buy any other brand, they are superior quality. Described as “the best natural condom you can buy,” SKINS are a revolutionary new condom that feels just like the real thing. That’s why they’re called SKINS. Using only premium quality latex and infused with the light scent of vanilla, Skins Natural condoms. Skins condoms are made using premium quality natural latex for a clear, natural feeling, strong condom. They are so thin they feel like a second skin! Never go in without a Skin! – No latex smell – Clear transparent in colour – Natural feeling – Extra lubricated for safety and comfort Skins Natural Condoms have a length of 190mm, nominal width of 52mm. 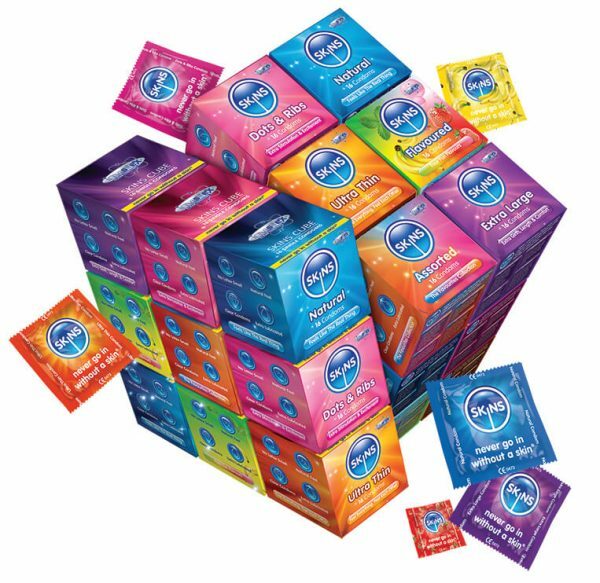 When used correctly, Skins Natural Condoms greatly reduce the risk of pregnancy and sexually transmitted infections, although no method of contraception can give you 100% protection. Contact me for free samples, or try a 4 pack. They also come in a smaller box of 4. I recommend you use the condoms with one of ID’s water based lubricants for maximum pleasure for both of you. You can find them here.